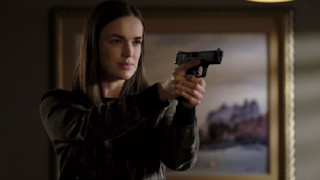 OLDNERD: Agents Of SHIELD: "Farewell, Cruel World"
It'snot easy kidnapping digital Nazi dads. There's very little to say about this week's Agents of SHIELD because it just goes where it needs to go and does what it needs to do. I suppose we could talk about Mac staying behind in the virtual world, but one, it's a tossup over whether or not it's temporary this season, temporary into next season, or permanent. Plus they've been setting it up really obviously since the first time we saw Virtual Mac. Aida can apprently teleport now that she has a human body and/or a magic bathrobe, which is new. But really, this was just the well-craftied semi-culmination of a well-crafted story that's covered the second half of the season. Nothing to analyze, really, nothing to complain about.